It was 1:05 on a Friday afternoon.....Helen Markham was on foot, walking south along Patton toward her bus stop, which was on Jefferson Boulevard. She was on her way to catch the bus that she took to work everyday. She knew that she would have to be at the bus stop before 1:12 so she was a bit impatient at being held up by the traffic as she waited to cross East Tenth street. Markham was just reaching the northwest corner of Tenth and Patton when she noticed Tippit's patrol car pass through the intersection, heading east along Tenth Street. Markham testified that the patrol car pulled up to a man who was walking on the sidewalk on the south side of Tenth Street. Helen Markham positively identified Lee Oswald as the man she saw talking to, and shoot, J.D. Tippit. She testified that she saw Oswald run from the scene, heading down Patton with a gun in his hand. Of course Mrs Markham was hysterical and obviously was mistaken in her identification which the cold chills she felt at seeing the men in the rigged line up were the means by which she identified Lee Oswald. But the man she saw shoot officer Tippit could NOT have been Lee Oswald ....because at the very moment that Helen Markham was walking toward the intersection of Tenth and Patton Mrs Earlene Roberts was watching Lee Oswald as he stood on the sidewalk in front of her rooming house at the intersection of Beckley and Zangs at 1:04 pm. The rooming house was nearly one mile away from the place where officer Tippit was being shot. I didn't write that he was a lone nut. I don't believe that I inferred that either. McDonald is quoted as saying that the firing pin failed when Oswald tried to shot him in the theater Are you saying he is incorrect?? So Oswald is in Gomer Pyle-like bliss up to the assassination about whatever is going on. Then it immediately dawns on him that he is going to take the fall for it. He suddenly becomes a genius. So he does the logical thing and kills a police officer. That is quite a fantasy tale. The most logical reason for him to have killed Tippit is because he has just assassinated the President and has nothing to lose at that point. He can't risk the possibility that he has already been identified as a suspect and will be arrested if he IDs himself. 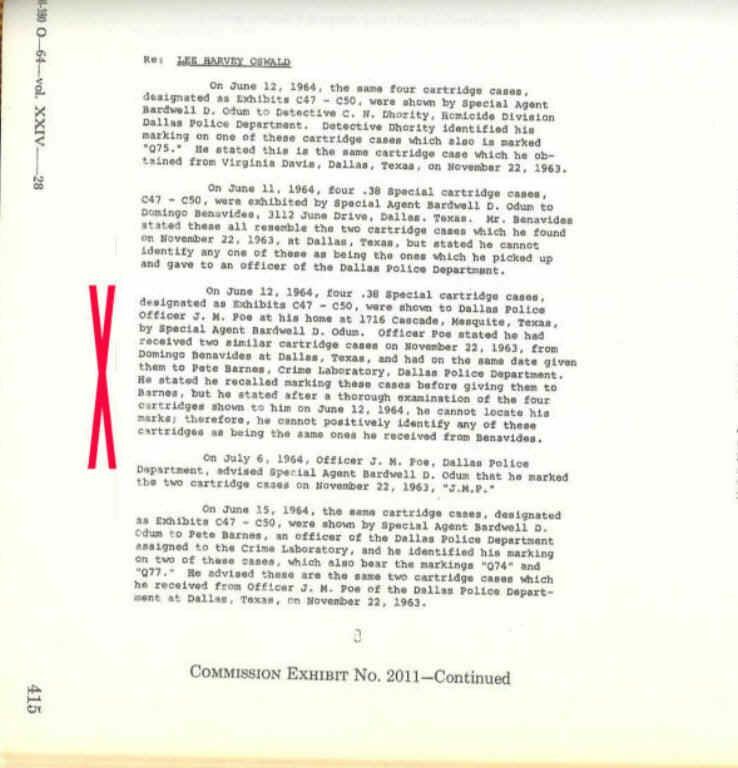 "The Commission claimed that Mrs. Markham identified Lee Harvey Oswald as the man who shot the policeman at a line up on November 22 and that in testimony before the Commission, Mrs. Markham confirmed her positive identification of Lee Harvey Oswald as the man she saw kill Officer Tippit. 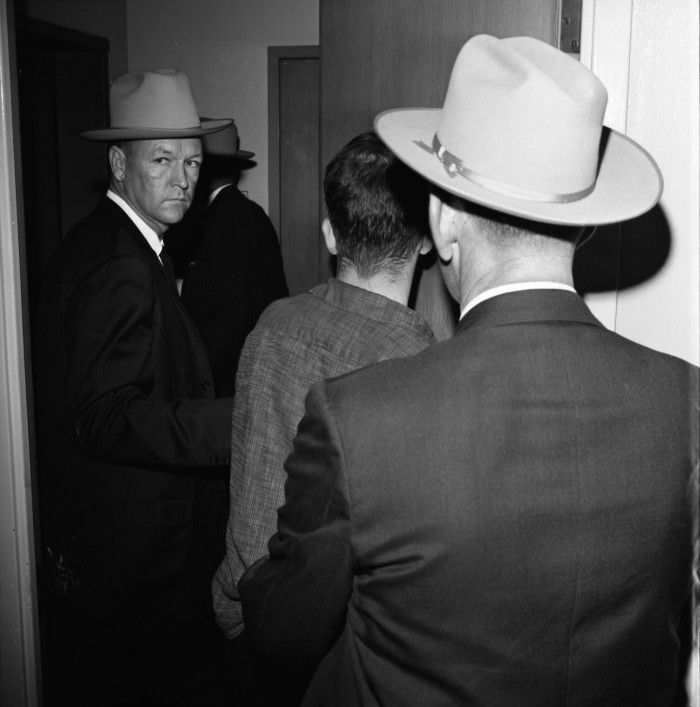 Captain Fritz - who needed that identification real quickly -- testified that the lineup was hurriedly arranged at 4:30 that afternoon, less than three and a half hours after Tippit's death and less than that after Oswald's arrest. Mrs Markham was "quite hysterical" when she arrived at police headquarters. Her state and the atmosphere in the lineup room are best described by the record of her testimony." Q: Now when you went into the room you looked these people over, these four men? Q: Did you recognize anyone in the lineup? Q: You did not? Did you see anybody-I have asked you that question before-did you recognize anybody from their face? preparation seems to have been for the purpose of leading the witness to give an appropiate answer." Q: Did you identify anybody in these four people? Markham: I didn't know nobody. Q: I know you didn't know nobody, but did anybody in that lineup look like anybody you had seen before? Markham: No. I had never seen none of them, none of these men. Q: No one of the four? "At this point counsel, a teacher of criminal law and procedure at the University of Southern California and a member of the U.S. Judical Conference Advisory Committee on Federal Rules of Criminal Procedure, asked a rather leading question. Mrs. Markham said that she recognized no one at the lineup; counsel tried five times for a more acceptable answer. Then, departing a little from the legal procedure he teaches, he next asked his friendly but disconcerting witness, "Was there a number two man in there?" Mrs. Markham replied, "Number two is the one I picked." Counsel began another question: "I thought you just told me that you hadn't, but Mrs. Markham interrupted to answer inexplicably, "I thought you wanted me to describe their clothing." Q: You recognized him from his appearance? Markham: I asked-I looked at him. When I saw this man I wasn't sure, but I had cold chills just run all over me. obtained the right answer: "Addressing itself solely to the probative value of Mrs. Markham's contemporaneous description of the gunman and her identification of Oswald at a police lineup, the Commission considers her testimony reliable." Mr. Ball. Anybody ask him about a gun, whether or not he bought a rifle? the rifle and about it being sent to the box here in Dallas but I do not recall. I am not sure he denied it but I do not recall what his exact denial was. that he had bought a rifle? Mr. Ball. Was anything said about a revolver? but I do not recall what it was. Mr. Ball Did you make any notes of the conversations? the interrogation of him by Captain Fritz or anyone. Mr. Ball. Is that the first time you had seen Oswald? jail and of course, I had saw him at the showups, what have you. Mr. Ball. Had you ever talked to him before? Mr. Leavelle. No; I had never talked to him before. Mr. Stern. He engaged in banter with you and police officials? but he did always smile and never hesitated for an answer, always had an answer. Mr. EISENBERG. Now, were you able to determine whether those bullets have been fired in this weapon? Mr. CUNNINGHAM. No; I was not. Mr. EISENBERG. Can you explain why? and 605, and one bullet of R.-P. manufacture. Mr. CUNNINGHAM. That is correct. and two Western cartridge cases. match a photo taken of LHO while in DPD custody on 11/22/63. Mr. BELIN - Where were you when your vehicle stopped? Mr. BENAVIDES - About 15 foot, just directly across the street and maybe a car length away from the police car.